Organized ski racing in America started near Lake Tahoe in the 1860s when gold miners rode 15-foot boards that reached speeds near 100 miles per hour. By 1895, residents of Truckee had started the nation's first winter carnival west of the Rocky Mountains and soon built the largest ski jump in California. Today's Lake Tahoe, with significant annual snowfall, has become home to the largest concentration of ski resorts on the continent. Places like Mount Rose, Squaw Valley (home of the 1960 Winter Olympics), Sugar Bowl, Heavenly Valley, Homewood, Sierra-at-Tahoe, Alpine Meadows, Kirkwood, Diamond Peak, Donner Ski Ranch, Granlibakken, and Northstar-at-Tahoe have seen skiing styles, sports, and fashions churn through the decades, while now gone resorts, such as Edelweiss and White Hills Ski Resort, echo the memories of yesterday's skiers through the pines. Lake Tahoe historian Mark McLaughlin operates The Storm King website (www.thestormking.com) and has authored five books on Lake Tahoe's history. 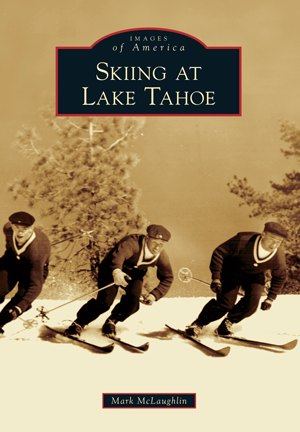 His works include The Donner Party: Weathering the Storm and Longboards to Olympics: A Century of Tahoe Winter Sports. With archival photographs from regional historical societies, such as the Donner Summit Historical Society, North Lake Tahoe Historical Society, and private collections, McLaughlin illustrates the evolution of skiing in one of America's most beautiful places.